Jimmy has the kind of story they make movies about. He was born into the type of poverty that nobody ever escapes. But, from an early age, he showed an uncanny ability to defy the odds. Jimmy went to the prestigious Howard University on a baseball scholarship, and seemed on track to leave the legacy of generational poverty behind. But, after five years, he left Howard, without a degree and without much hope for his future. But, Jimmy knew how to work hard. Through a combination of ambition and good fortune, he left the world of menial jobs by discovering his true passion and talent, managing golf courses. Golf would take him all the places he once hoped baseball would. 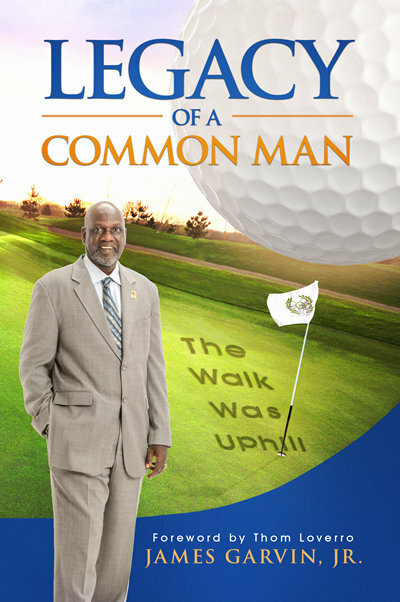 Jimmy became the first African-American president and partner in Golf Course Specialist’s history. A recognized community leader, his life was chronicled in the Golf Channel’s 2011 special, Golf in America: The Jimmy Garvin Story. He is also is the recipient of Proclamations from the District of Columbia, Maryland and Florida. But, while he steadily climbed to the top of his profession, he made a few ill-advised decisions. After finally achieving everything he had ever hoped for, everything once again came crashing down as he faced a federal indictment for a crime he didn’t commit. Would Jimmy be able to get his life back on course after this seemingly complete fall from grace? Legacy of a Common Man is a story of resiliency and ambition in pursuit of the american dream and just how fragile that dream can be. Get inspired by one of America’s great-untold stories.